I use three computers and three types of operating systems day to day. And I’ve found it challenging. Of course I don’t like this situation - but there’s nothing I can do about it but try to adapt. I own a 2011 macbook air which I enjoy to use in a coffee shop for doing documentation, research, or remote into Silver. I also have Silver, a skylake core i7 linux box at home for those number crunching works I do and games. And recently I joined Accenture, I was given a windows 10 laptop for my work that I was not allowed to partition the hard drive or use docker or vms easily because of the internal security requirement. With Atom, I was able to set up a uniformed development environment across three platforms for everything (of course not literally everything but those I need to use: R, Python, SQL, html, css, shell scripting). It helps the confusion by switching between different platforms regularly, it helps me be able to do my work no matter which machine I am on, also it helps me with my code quality to be able to reproduce results on any of my machines. download and install atom from here or go to atom website and directly download. Install R from here or find the link yourself on this R project home page. Also install Rtools following the instruction here, Make sure the system path is correctly set and R can use Rtools by printing out Sys.getenv('PATH'). Open preferences in Atom ‘CMD + comma’ and go to the Install menu item. Search there for the packages. Or in powershell, terminal or whatever, type in apm install a-list-of-the-packages. 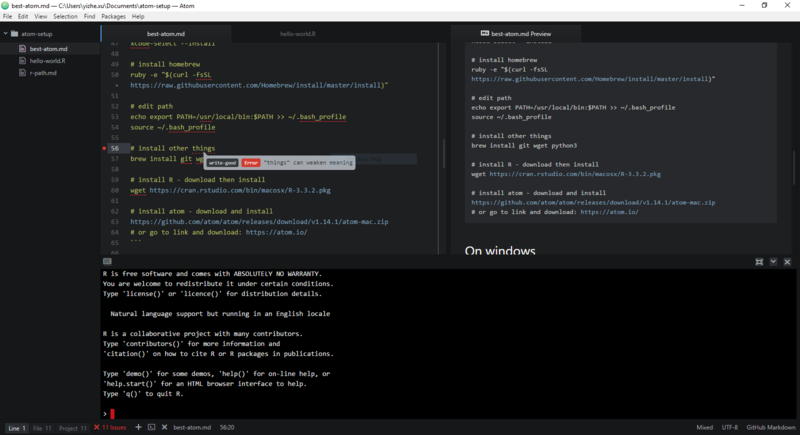 markdown-preview-plus for markdown preview with mathjax support. Note that you need to disable the default markdown-preview package if you want to use this.